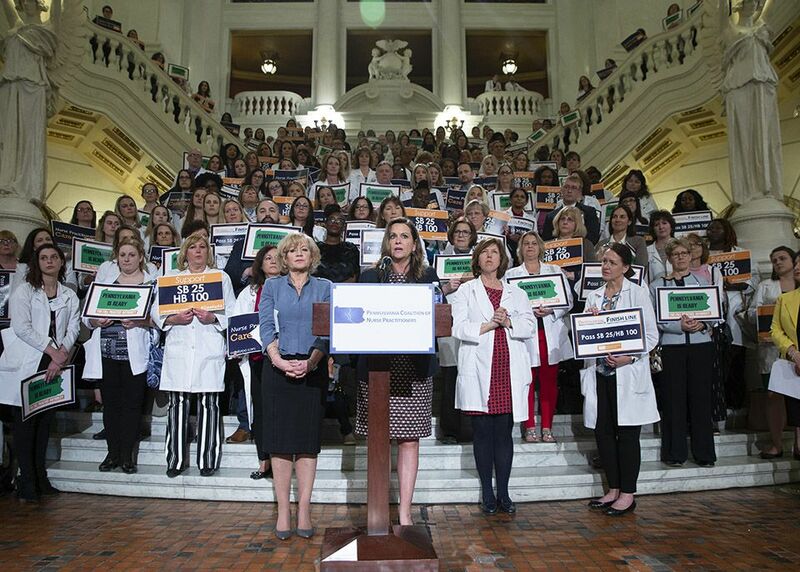 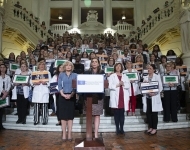 April 9, 2019: Senator Bartolotta stands with members of the Pennsylvania Coalition of Nurse Practitioners and Senator Lisa Boscola to call on lawmakers to support Senate Bill 25, legislation she is sponsoring that would extend full practice authority to nurse practitioners. 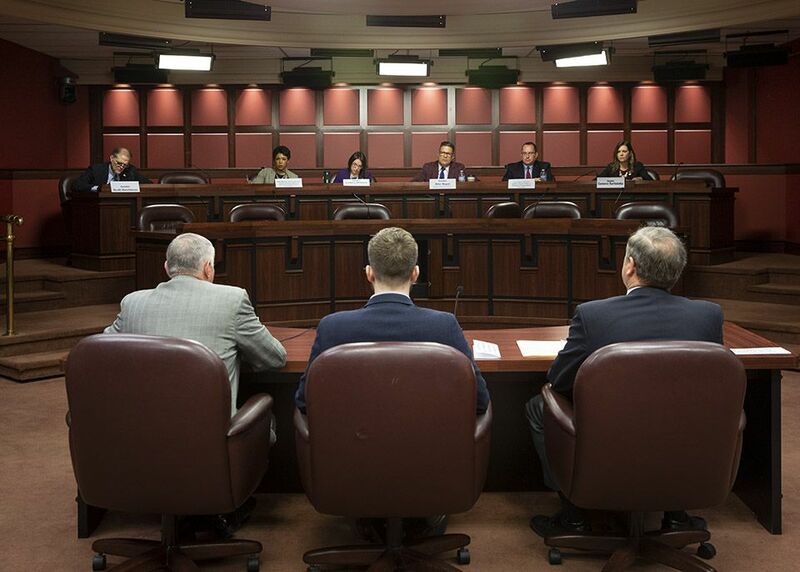 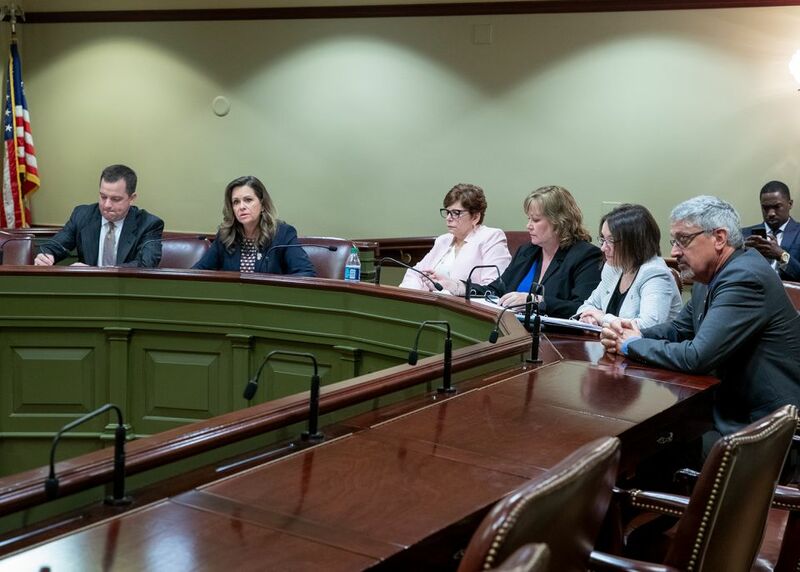 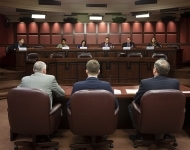 April 9, 2019: The Labor and Industry Committee chaired by Senator Bartolotta holds a meeting to consider legislation sponsored by Senators Lisa Baker and Judy Ward. 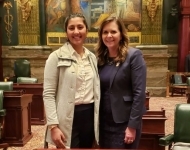 April 8, 2019: Senator Bartolotta welcomes Pastor Charles Schaller from St. Paul’s Episcopal Church in Monongahela to the Senate and thanks him for serving as guest chaplain and offering the opening prayer for session. 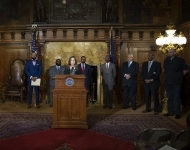 April 8, 2019: During a press conference to announce reforms to the state’s pardon process, Senator Bartolotta talks about the need for legislation addressing the automatic expungement of crimes from the public record to occur in conjunction with a pardon. 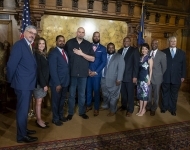 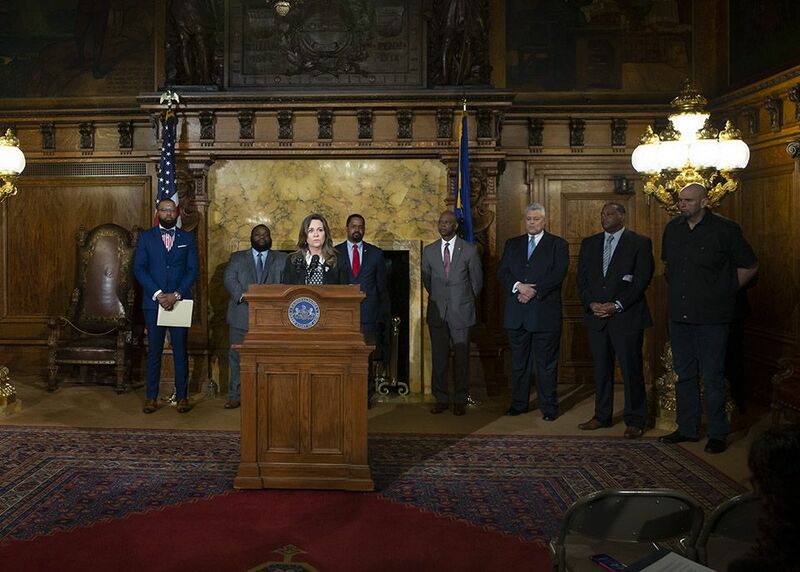 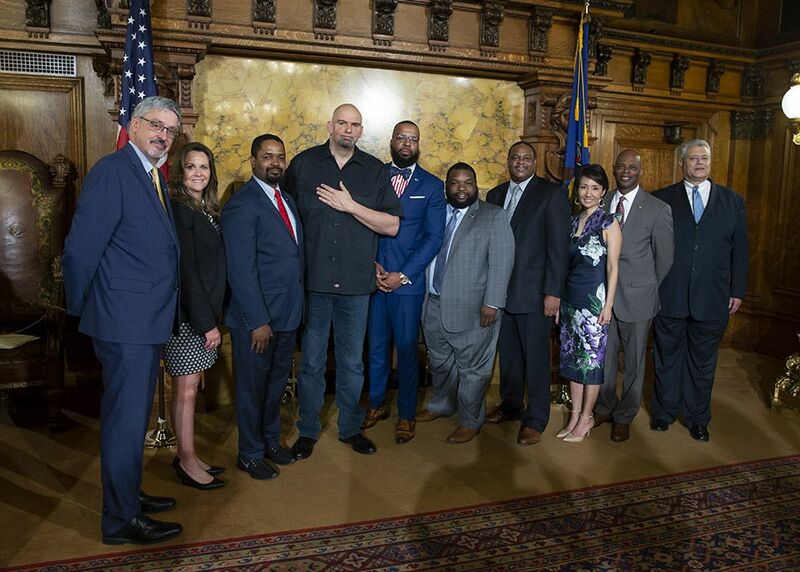 April 8, 2019: Senators Bartolotta and Street, Representatives Harris and Gainey and others join together with Lieutenant Governor Fetterman to announce reforms to streamline the state’s pardon process, including the appointment of Brandon Flood as the new Secretary of the Pennsylvania Board of Pardons. 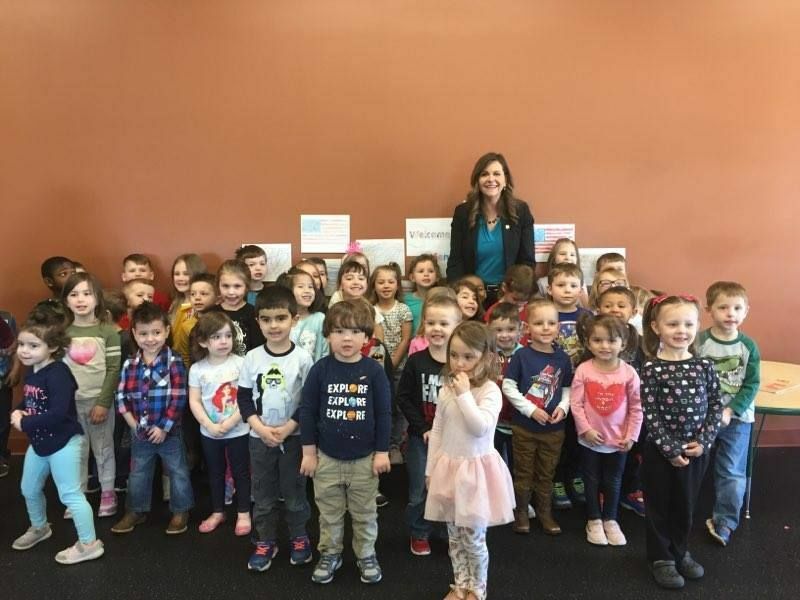 April 3, 2019: Senator Bartolotta celebrated Young Child Month by reading to students at SmartKids Child Care and Learning Center in Meadowlands. April 3, 2019: Senator Bartolotta visited SmartKids Child Care and Learning Center to learn more about the opportunities and challenges with early childhood care. 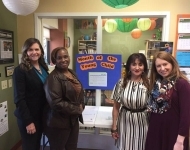 Also pictured: Teri Gilmore, Trying Together; Donna Shriver, President of SmartKids; and Emily Neff, Trying Together. 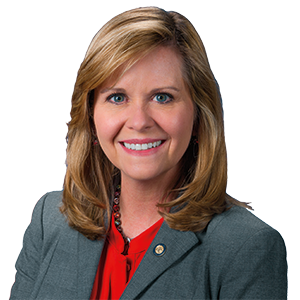 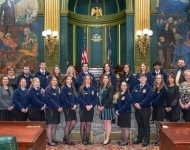 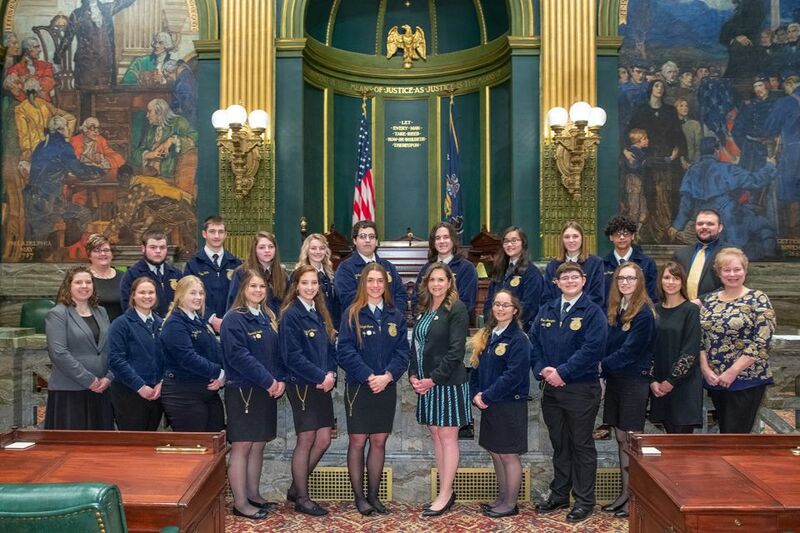 March 26, 2019 - Senator Bartolotta hosts and introduces on the Senate floor members of the Pennsylvania FFA from the 46th Senatorial District, including those from H.G. 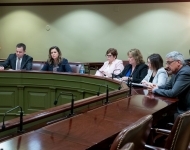 Parkinson, McGuffey, Trinity, and West Greene. 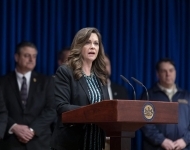 March 26, 2019 - During a press conference in which she is joined by Senate colleagues as well as business and industry leaders, Senator Bartolotta speaks about the economic and public safety benefits of pipeline infrastructure development. 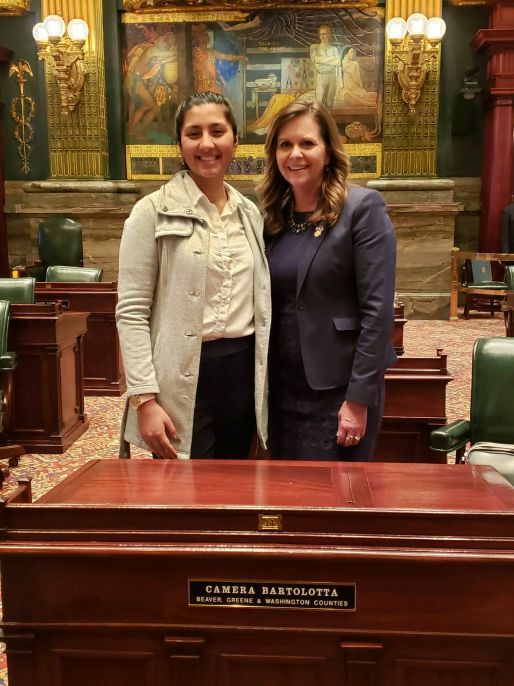 March 26, 2019: Senator Bartolotta introduces on the floor of the Senate her guest shadow, Simmi Sharma, who is a sophomore at the University of Pittsburgh majoring in political science. March 25, 2019: During a public hearing of the Veterans Affairs and Emergency Preparedness Committee, Senator Bartolotta listens to testifiers discuss her legislation requiring state agencies to provide appropriate credit for military service toward licensure and certification requirements. 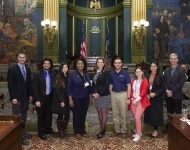 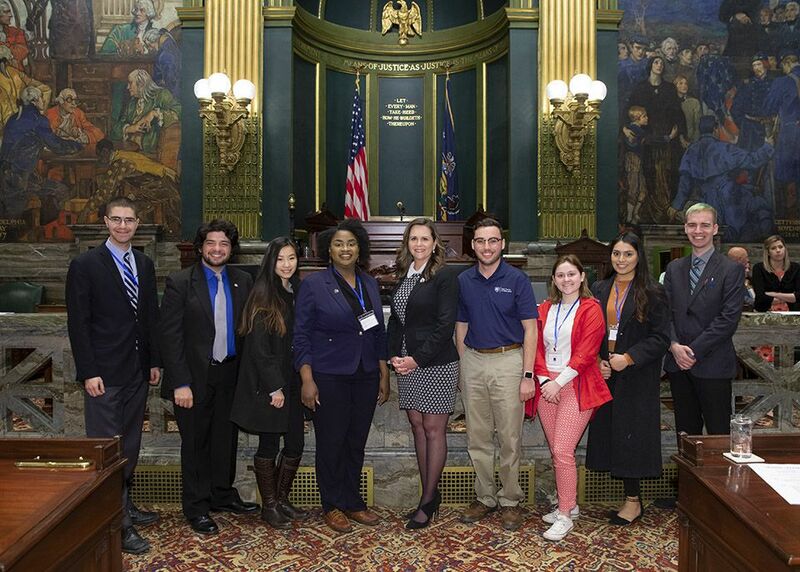 March 20, 2019: Senator Bartolotta welcomes to the Senate students and their advisers from University Park and the Penn State Beaver campus as part of the institution’s Advocacy Day in Harrisburg. 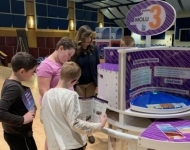 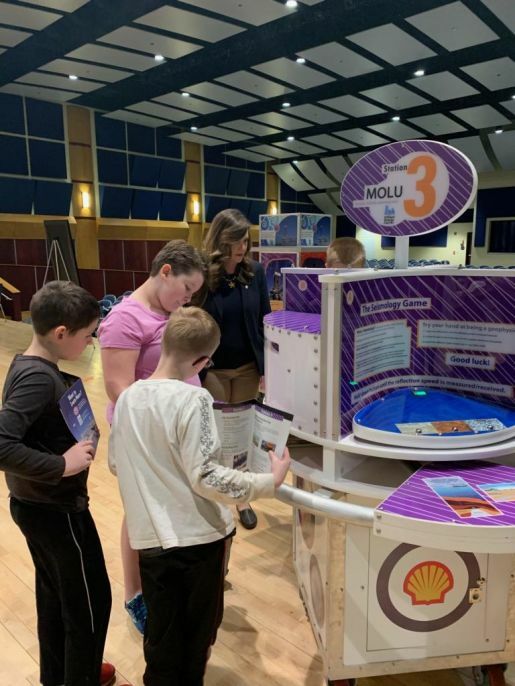 February 28, 2019 – Senator Bartolotta observes middle school students from the Ringgold School District take part in the Mobile Oilfield Learning Unit (or MOLU), an effort sponsored by Range Resources Corporation to introduce Pennsylvania youth to STEM subjects used in the oil and natural gas industry. 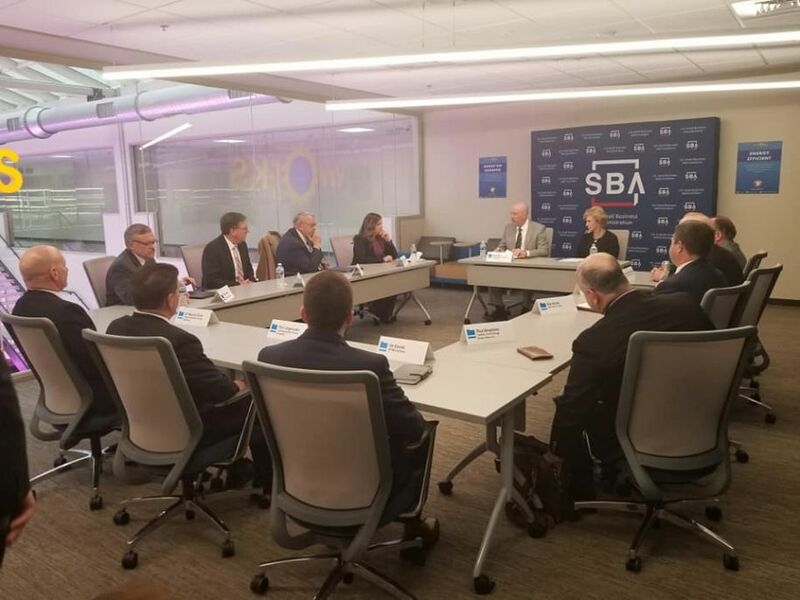 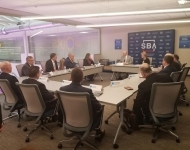 February 26, 2019 – Senator Bartolotta participates in a trade roundtable discussion held at the Commonwealth Charter Academy and led by Small Business Administrator (SBA) Linda McMahon and leadership from the Pennsylvania Chamber of Business and Industry. 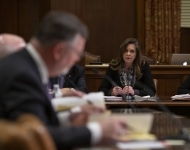 February 25, 2019 – During the Senate Appropriations Committee budget hearings, Senator Bartolotta questions Department of Labor Secretary Jerry Oleksiak on a number of areas of concern for local communities. 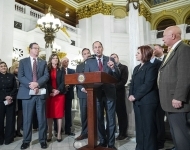 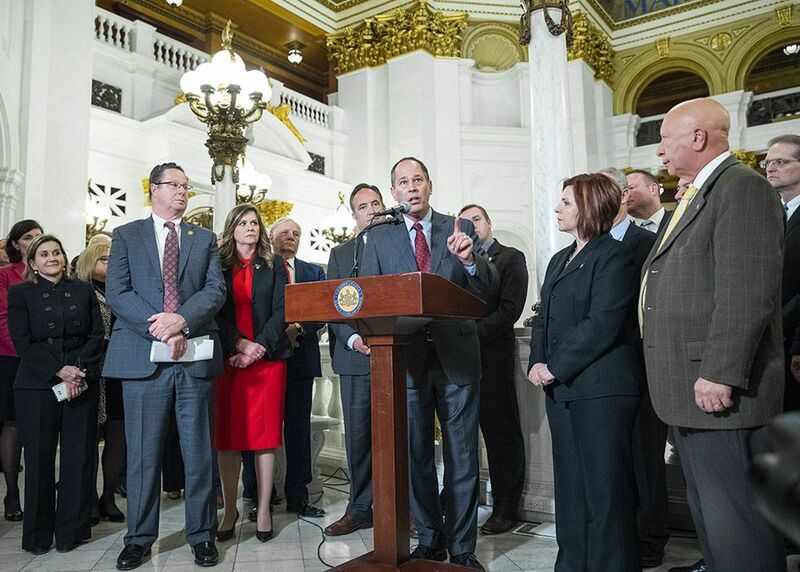 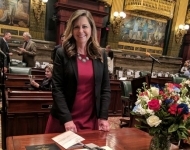 February 5, 2019 - Senator Bartolotta stands in support with her republican colleagues including Senate President Pro Tempore Joe Scarnati to share reaction to Governor Wolf’s budget address. 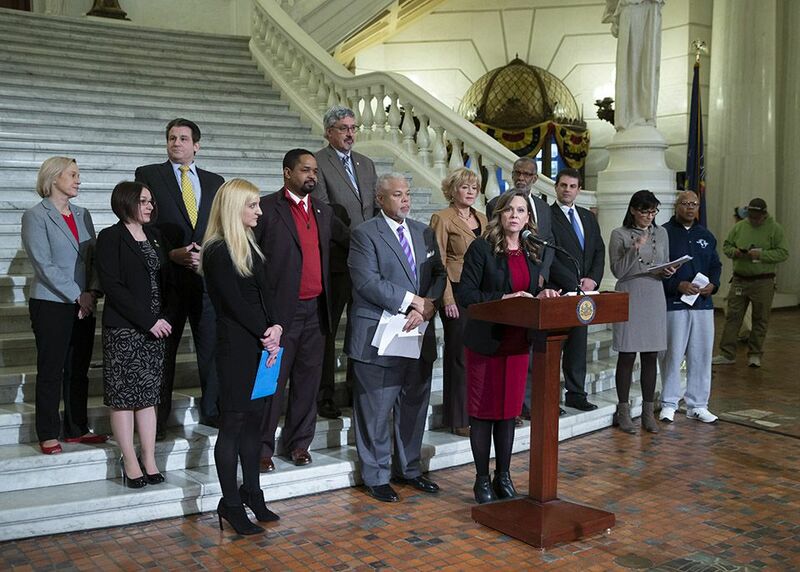 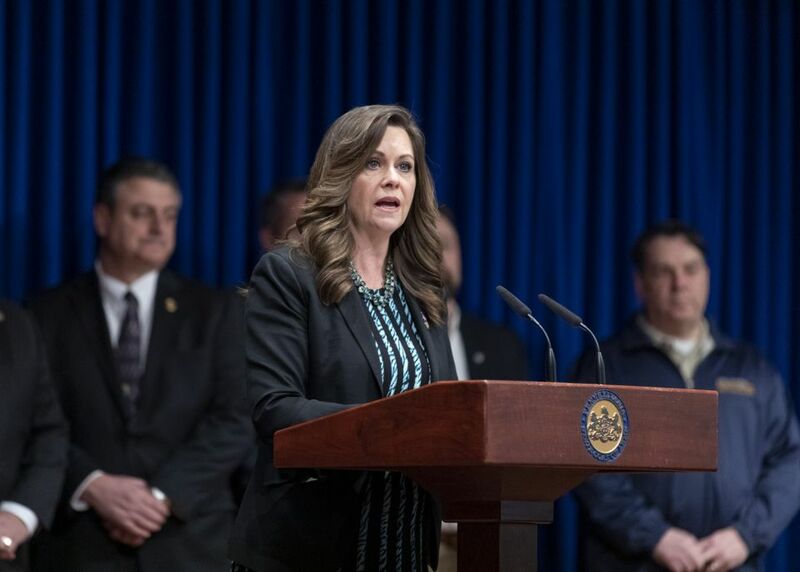 January 28, 2019 - During a press conference, Senator Bartolotta discusses Senate Bill 14, comprehensive probation reform legislation which she has sponsored with Senator Anthony Williams and which is intended to make changes to Pennsylvania’s probation and parole laws. 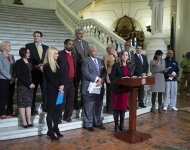 Also pictured at the event are advocates including The Commonwealth Foundation, Justice Action Network, the ACLU of Pennsylvania and others. 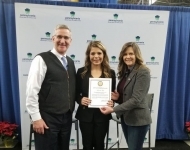 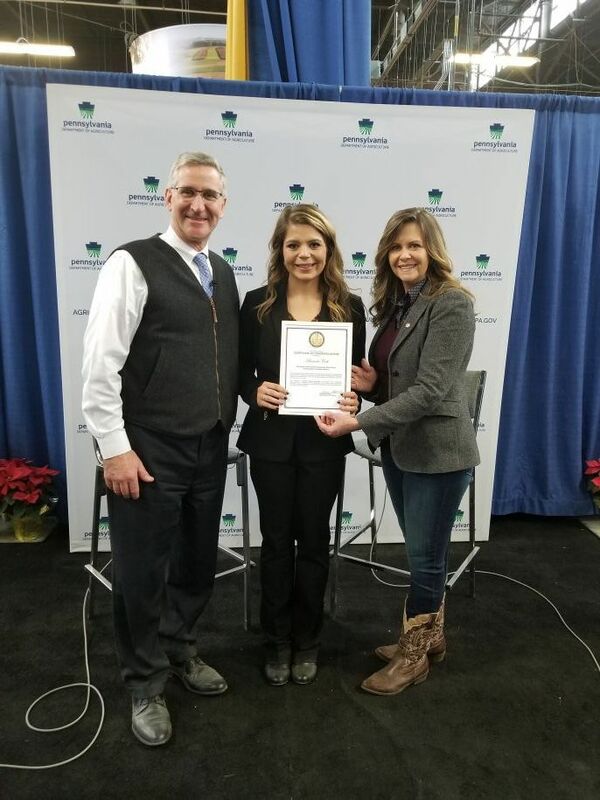 January 8, 2019 – Senator Bartolotta and Secretary Russell Redding of the Department of Agriculture congratulate Amanda Cole of Bentleyville for being awarded a 2019 Farm Show Scholarship Award. 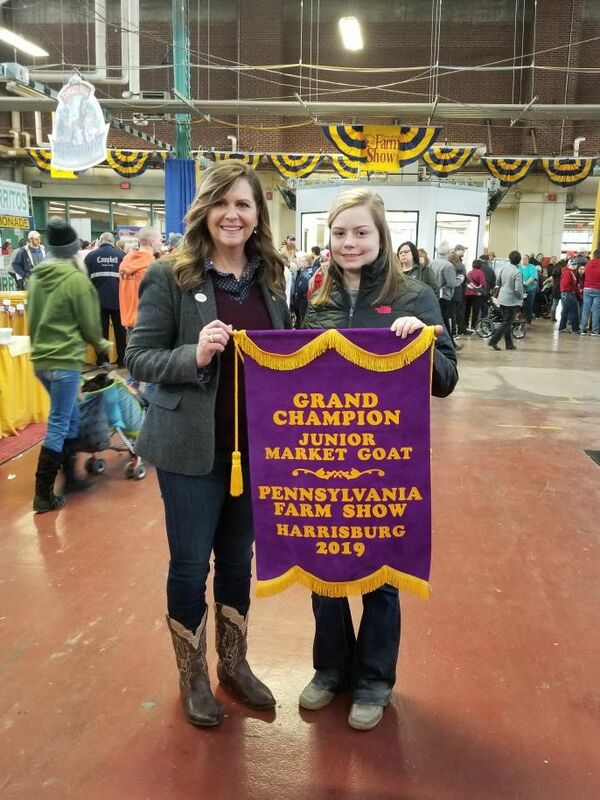 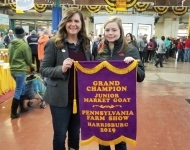 January 8, 2019 – While visiting the 103rd Pennsylvania Farm Show, Senator Bartolotta spends time with Grand Champion Market Goat exhibitor Alexa Miles of Fort Cherry Junior/Senior High School. 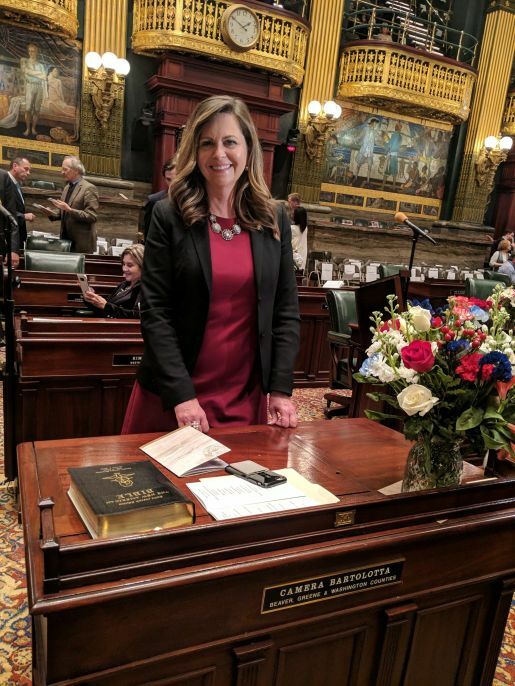 January 1, 2019 – Senator Bartolotta is pictured at her desk in the Senate Chamber prior to being sworn-in for a second term in the State Senate. 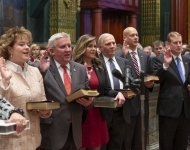 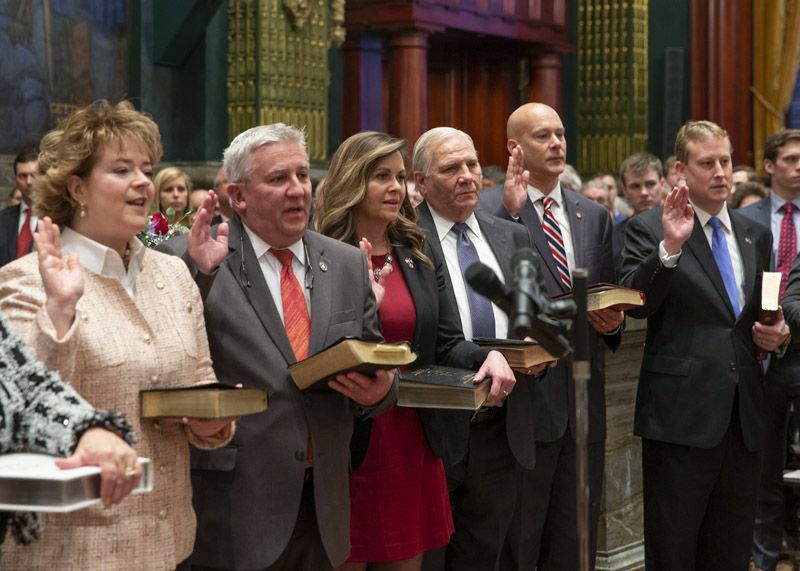 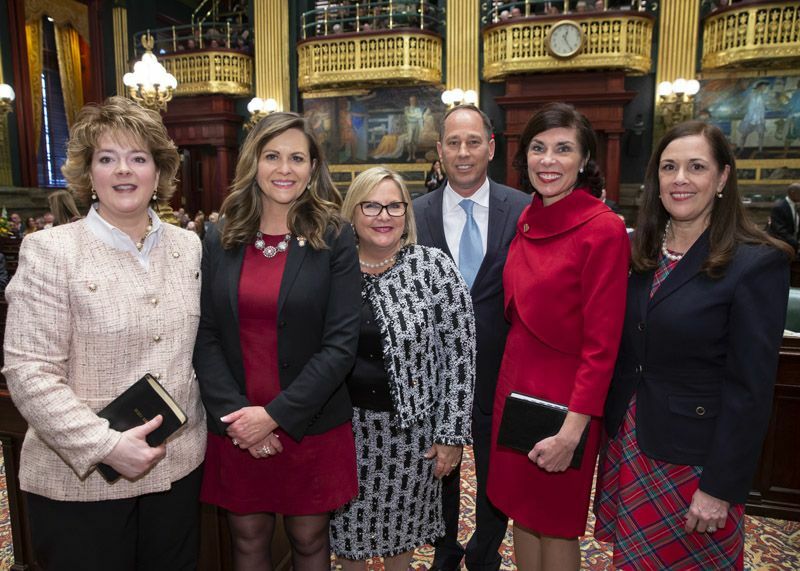 January 1, 2019 – Newly elected and re-elected members of the Senate are sworn into office on the first Tuesday of January by Chief Justice Thomas Saylor who administered the oath. 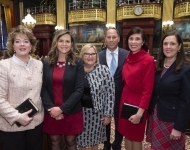 January 1, 2019 – Following the swearing-in of members in the Senate, Senator Bartolotta poses for a photograph with President Pro Tempore Joe Scarnati, Senators Michele Brooks and Lisa Baker, and newly elected members, Judy Ward and Kristin Phillips-Hill. 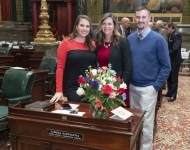 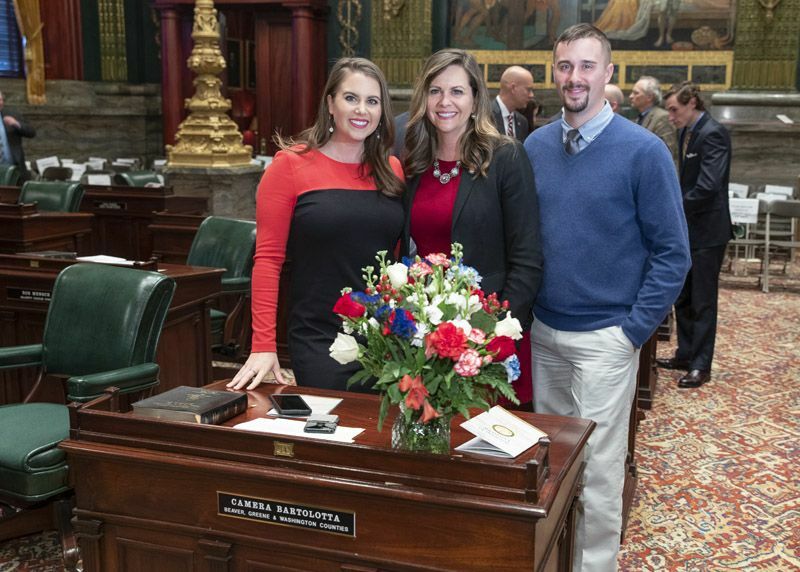 January 1, 2019 – Senator Bartolotta’s children, Devin and Dante Bartolotta, attend the swearing-in festivities.